Plans for a new residential hotel were presented to the Plan Commission on 03/12/2014. The packet of information provided to the Commission about this new residential hotel can be found here, starting on page 13. This is a lengthy, detailed packet with diagrams and photos. They propose a Planned Development that would construct an eight story 114-room extended stay hotel (Hyatt House) with a total of 35 parking spaces located at 1515 Chicago Avenue. The property is currently vacant. The one story office building and a surface parking lot previously located on the site were demolished in 2011. The proposed extended stay hotel will provide amenities to guests staying for an extended period of time with the average guest stay just over five days. The developer indicated the plan to be issued a final certificate of occupancy for the new building sometime around early August 2015. Hyatt House is a large operation of residential hotels, with many locations. The brand has recently been announced to start in China. 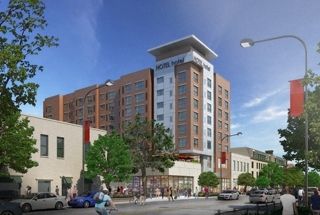 A overview of existing hotels in Evanston can be found here.